Here are a handful of Frequently Asked Questions about Greyhounds. Contact us for additional questions. Now that having retired racing greyhounds have come to the public attention in the last few years, most people know very little about them. When I walk my hounds people will stop and ask me questions about them, hopefully I will be able to answer some of your frquently asked questions also. Greyhounds are sight hounds that naturally have a high Prey Drive, but the adoption groups will test to make sure that they will be safe with small animals. 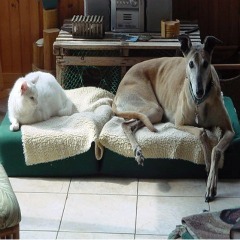 They don’t want to put a greyhound in a home and have them harm the cat. Be aware that inside cats are different than outside cats, inside they may be best of friends but outside the greyhound may see the cat as Prey. So be a responsible pet owner and keep your cat inside.We have two rescued cats who tell the greyhounds what rooms they are allowed to go and what room is for Cats Only. No greyhounds are the most laid back dog I have ever known. Do they need a lot of room to run? No-I always tell people that once you retire you don’t want to go back to work. I take my greyhounds for a nice walk every morning and when we come home they have their breakfast then take a nap. They are as good with children as the child is with them. Children should be respectful of a pet, they are not a stuffed animal that can be jumped on or have their ears pulled. Greyhounds have a very docile personality but they do feel pain so don’t let a child pull a dogs tail, ears or pound on their back. ALWAYS ask the owner if your child can pet their greyhound and don’t just let the child run up to the dog. No, because of the physiology of the greyhound they expend large amounts of energy when they run and require quite a bit of “down time” sleeping recharging their energy. A nice long walk—which is good for the owners too—and they are good for the day. Greyhounds will spend more time sleeping than most other breeds of dog. NO—you rarely see a greyhound growl or bark. But people assume that they wear muzzles on the race track because they are nasty. But you know what they say about assuming—the muzzles are to prevent them from nipping a competitor on the track it also clearly shows the Judges whose “nose” finished the race first. Will they be all right in an apartment? All they need in a home is a place to sleep and a nice walk every day. They may have to be taught to go up and down stairs so do tell your adoption interviewer that you live in a second or third floor apartment. Greyhounds have no concept of stairs because they have never encountered them. They learn very quickly though. 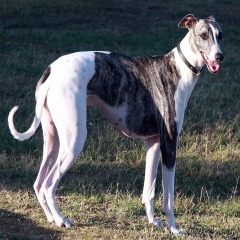 Greyhounds begin their racing career at the age of about 18 months. They are given two races in three different categories and if they do well in any one of these categories they will continue racing, if not they are adopted out—hopefully. So retired racers can be anywhere from 18 months to five years at which time it is mandatory retirement, occasionally a trainer will find that they just don’t have the qualifications and you may find a younger greyhound ready for home life. Until the rescue groups came into power no one really know just what the life expectancy of a greyhound would be—because when their racing career was over so were they, they were “put down”. Now that the public has come to know this wonderful gentle breed and have found their way into the hearts of good people, we now know that they will live 14 or 15 years. There was one lucky greyhound in Florida who was just a little over TWENTY years old. A full grown male greyhound will usually be around 75 pounds and females average 65 pounds. There are variations to this rule, our Killian was a very large male and weighed about 90 pounds and could put his chin right on the kitchen counter to check out what was cooking. Our Elle was a very tiny female and never got much above 45 pounds. Why are they wearing coats? Greyhounds have very little body fat which acts as insulation, so, in cold weather they need to have a coat to avoid hypothermia. You don’t need to put a coat on them if they are just going out in the yard for a quick tinkle but a long walk requires a coat. Why can’t you use a choker collar on a greyhound? Greyhounds have a long delicate neck and choker collars can injure the soft tissue in their neck. Martingale collars work the same as a choker but much more gently on their neck. The neck of a greyhound is wider than their head so a collar that adjusts is vital to their safety. And they can be stunningly stylish. Are they prone to illness? Greyhounds are a strong athletic breed which have been bred to RUN, not to look good in the show ring. They are not prone to hip dylplasia as some large dogs. Most of the health issues are track injury related problems. With good nutrition, and loving home and good veterinarian care they will have a long healthy life. Most adoption groups will charge $250 to $300 for the greyhound. This will cover their cost of buying the greyhound from the owner, neutering, shots, bathing and very often a collar and leash and perhaps a bag of food. When I hear about the outrageous prices people pay for Designer Dogs I think about how many greyhounds could be rescued for that amount of money! How many states still have Greyhound Racing? Currently only seven states still have Dog Tracks. Since we began adopting greyhounds this had been cut down from 17 states. It is hoped that within the next few years they will all be closed. Can I get a specific color? Some adoption groups have facilities where you can go and see the greyhounds which are available for adoption. Other groups will receive greyhounds when they have adopters ready to bring the greyhound home. You can specify a color, age or gender but may have to wait for a little longer. What happens if the greyhound does not get along with my other dog? Call the rescue people immediately and they will come and pick up the greyhound. No one wants to have dogs not getting along and possibly be in danger. We travel a lot, what do we do with a greyhound when we travel? If you are driving there are many hotels, motels and Bed and Breakfasts who welcome dogs. We found a wonderful place in Delaware that caters to the whims of dogs. They have a fenced dog run and have biscuits for the dogs every morning.If you fly then ask your rescue group if there are members of the group who baby sit for dogs. I prefer to have someone I trust watch my “babies” rather than a Kennel—after all you are going on vacation why put your greyhound in jail? Do they come with a name? All greyhounds come with a registration name from the breeder; this translates to their Track Name. But they don’t really know their name; with forty or more greyhounds for the track help to take care of the greyhounds are not called by name. They are considered athletic equipment. So you can keep the track name—which most often is pretty lame—or choose a new name. It is the tone of your voice rather than the name you call them that they respond to. Can I run them on the beach? It is not recommended to allow greyhounds to run loose unless it is a fenced area. They can reach a speed of 0 to 25 in the space of three leaps and will run so far that they will not be able to find their way home. When they see something they want to chase they visually lock on to that prey and all the other senses will almost shut down, so you can call them and they will not hear you. Keep these athletes safe and on a leash when not in a fences area. Why do they need to eat off a raised stand? This is due to their height and their long necks. Bending down to eat off the floor sometimes causes the dry food to get “stuck” in their throat they will then cough it out, usually all over the floor. Questions about living with your greyhounds, Ask Cathy.